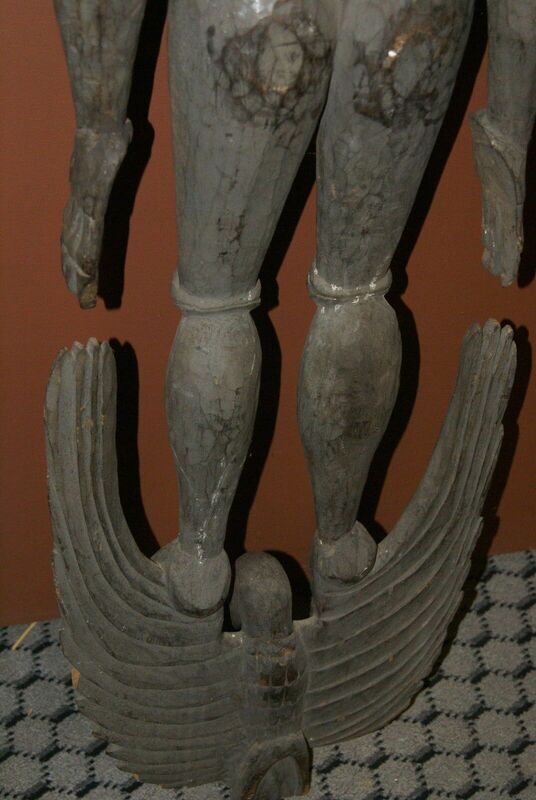 Item 30A2 in our inventory. 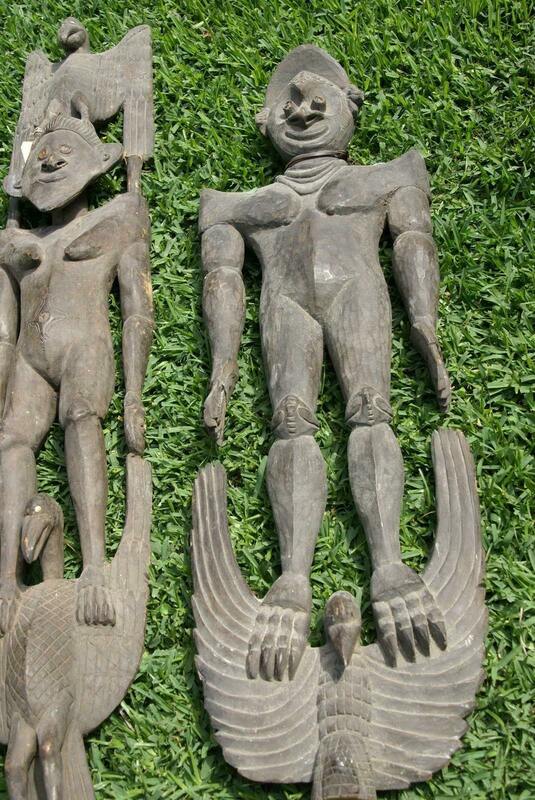 All our Tribal Sepik river carvings, from Papua New Guinea, were collected on the premises. 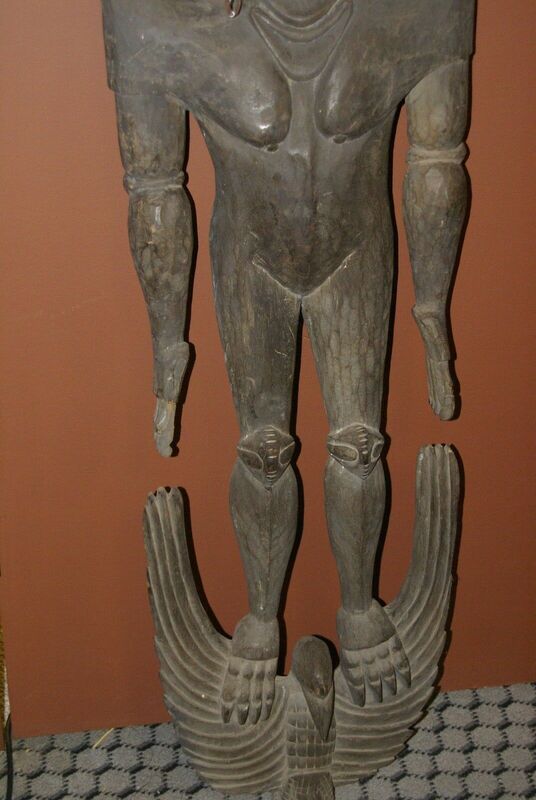 Large Oceanic Sepik Ancestor Spirit Figure to accommodate benevolent spirits 50" X 15" X 4" and 18lbs Used as a Suspension Hook or Bara Kundambuk from the Iatmul Tribe, Collected more than 20 years ago in Kandingai (kandigai) Village, Upper Sepik River region, Papua New Guinea. 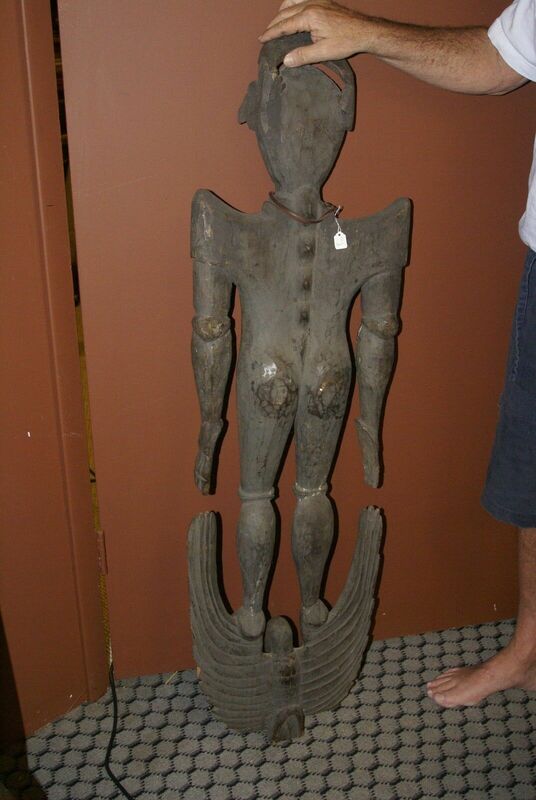 This suspension large Hook Statue was hand carved out of local wood with eyes of inserted shells. 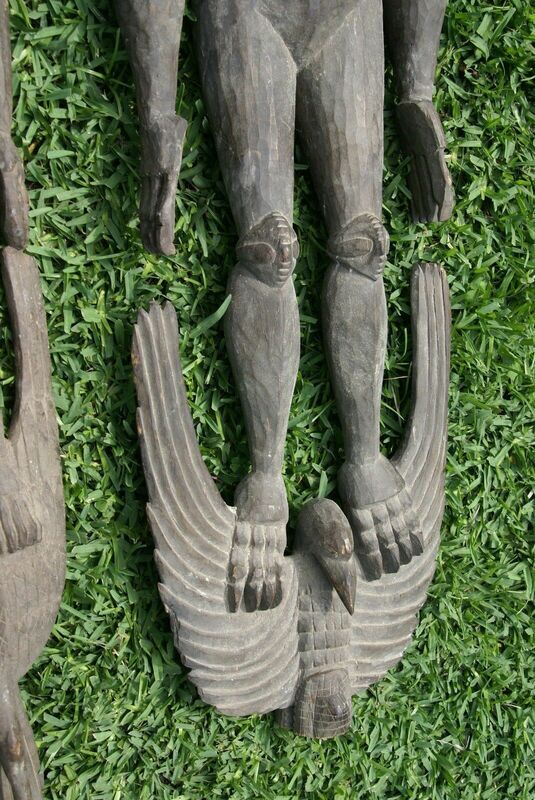 Animal forms are often incorporated into the carvings, in this case an eagle supporting the Ancestor’s feet which themselves have claws, as the figure is 1/2 man, 1/2 bird. 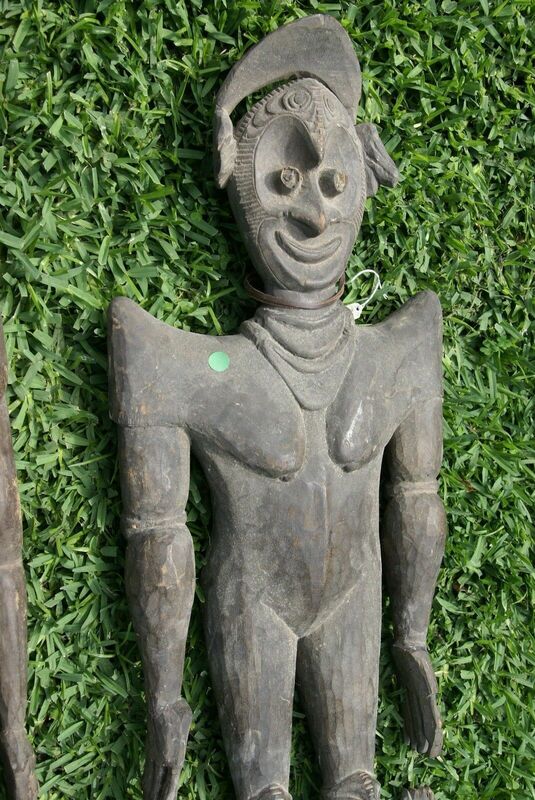 Some hand carved necklaces around the neck. 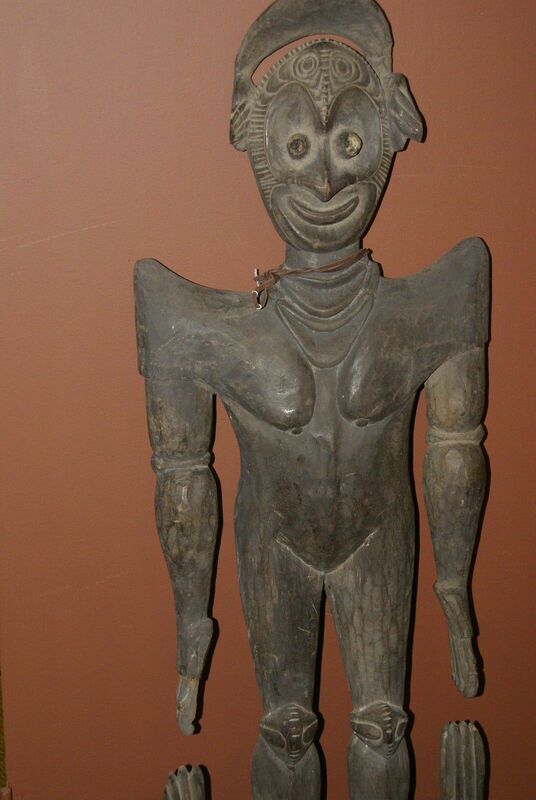 Hooks are used along the Sepik as the rest of PNG for both secular and ceremonial purposes. 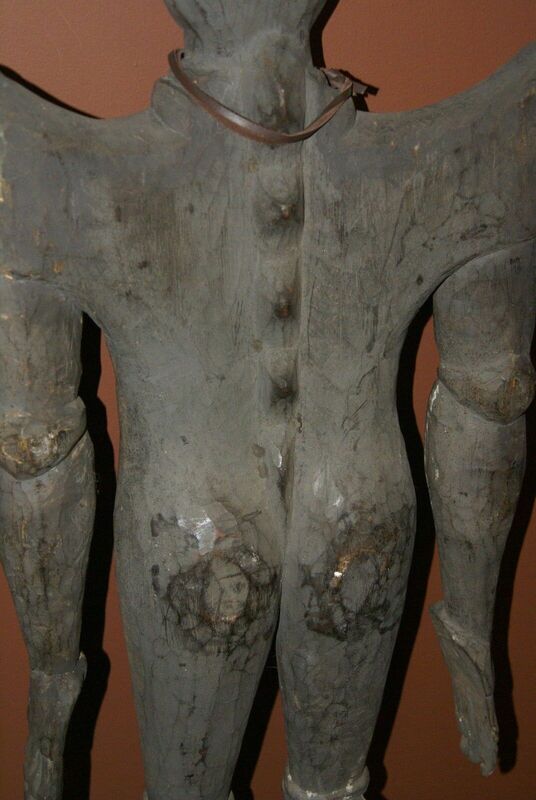 They are suspended in the mens house and in individual houses to hang valuables or ritual items as seen on photo 2. They each belonged to individual clans. 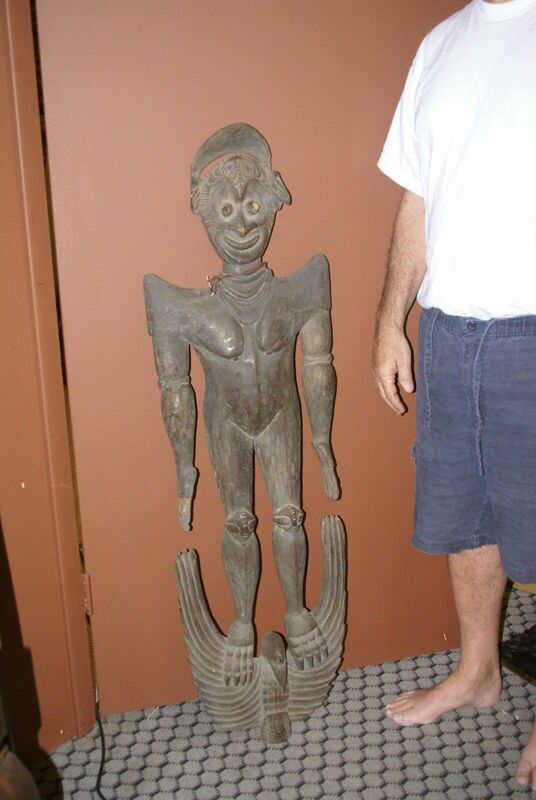 Photo 2 shows a hook hanging in a house on the sepik, that we took while there. Food hooks are used functionally to preserve food: Food goods are hung from the hook in bilums (woven bags) to keep it safe from rats and mice. Suspending food from the food hook discourages vermin, and the spirit thought to inhabit the hook is believed to retard spoilage. In the houses, Bilum bags filled with food and possessions were hung from such Food Hooks to keep necessities off the floor, out of the way of children, dogs and vermin, especially during the wet season as the land became inundated and rats moved from the bush into the roof thatching (called Marota). At this time of year, food is scarce and the rats will eat anything. 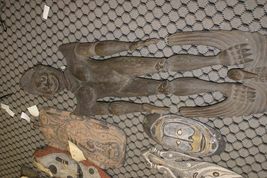 For protection, the food is then placed in baskets or string bags (called bilums) and hung from these hooks. 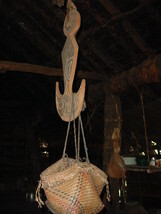 The basket hook is attached to the rafters with a length of split cane (Kanda) and a wide, flat piece of bark is threaded onto the cane to prevent the rats from climbing down from the rafters to the food. 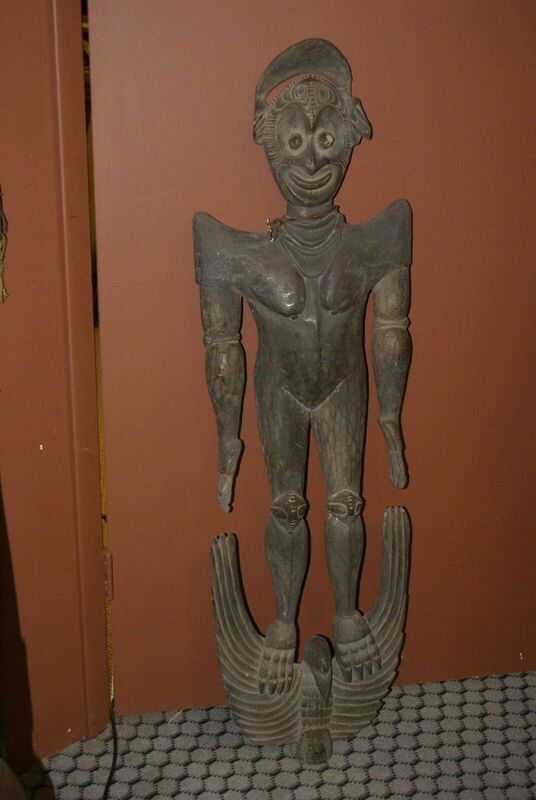 Cult hooks, food hooks and skull hooks/racks have evolved artistically over hundreds of years, with each village or district developing its own distinct style. The artistic development of hooks has sometimes overtaken their functionality to the point where some samples of this genre no longer have any notches to 'hook' things on. We go straight to the source to find these treasures. 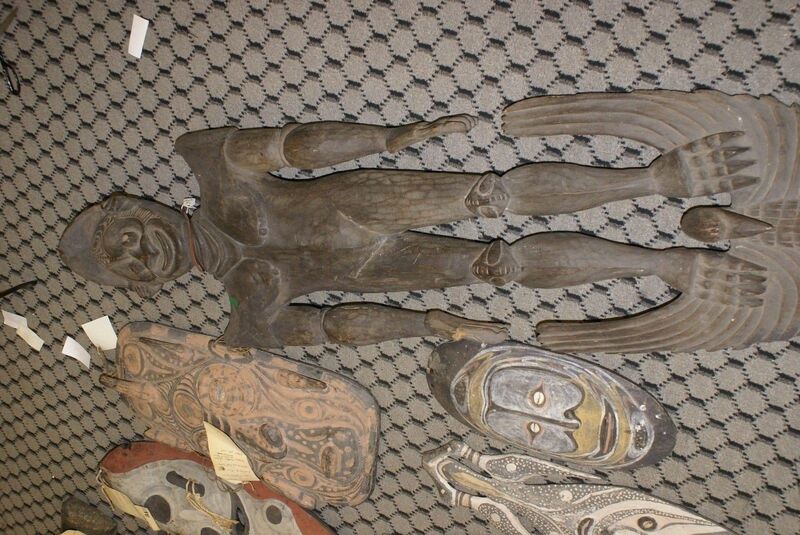 All our collector and rare items come with pages and pages of research about provenance, and with history of the tribes and photos as well, depending on item and whenever possible. When shipping internationally, we group ship multiple purchases to save you money, and find the best rates available.